Truffled Mashed Potatoes - A recipe from Savor California, the online showcase for extraordinary gourmet foods and beverages from California. Drain potatoes, reserving 1/2 cup cooking liquid if making potatoes ahead. Return potatoes to pot and set over low heat. Gently stir until dry, about 1 minute. Meanwhile, gently heat whole milk, (thyme and bay leaves, if desired), and Truffle Butter in a small saucepan over medium heat. Remove from heat. 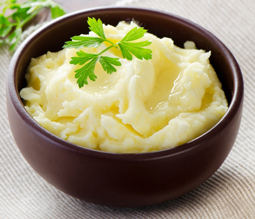 Serve mashed potatoes with a dollop of truffle butter on top. If you want to cook the potatoes ahead, make sure to reserve 1/2 cup of the potato cooking water before draining. Rice potatoes and return to the pot; stir in dairy, season, and cover. As serving time approaches, place the pot over low heat and add 1/4 cup of the cooking water, stirring, until the mixture is hot. Add the remaining 1/4 cup cooking water if needed.